Jimmy Carter was the 39th President of the United States who served in office from January 20, 1977 to January 20, 1981. What was the life of Jimmy Carter like? The short biography of President Jimmy Carter covers important information and facts about his early life, his family, career and the famous events and achievements of his political life. 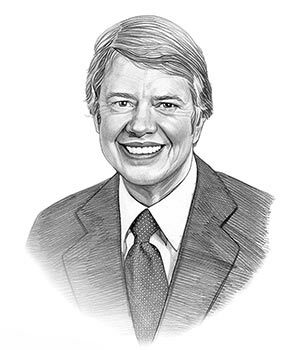 Our short biography of Jimmy Carter provides an interesting and easy way to learn about the life of the President. The following important facts provide a fast overview of important facts about President Jimmy Carter. Facts and Info: Jimmy Carter was the 39th president of America. His important accomplishment was the Camp David Peace agreement between Israel and Egypt. His failures were the economy and the Iran hostage crisis. For additional info refer to 20 Facts about Jimmy Carter. Facts and Info: James Earl Carter was born October 1, 1924 in Plains, Georgia. His father, known as Earl, was a wealthy farmer, peanut broker and businessman. The Carter family has a long heritage first arriving in the American Colonies from England in 1635. An unpretentious man, he has always insisted on being called "Jimmy" and not "James." Facts and Info: The career of Jimmy Carter included the roles of Soldier, Peanut Farmer, Professor, Politician and Statesman. He had an excellent education and studied at Georgia Southwestern College, Georgia Institute of Technology and the US Naval Academy where he studied nuclear physics. He became the 39th President of America in 1977 and served for 4 years until 1981. Facts and Info: Jimmy Carter married Rosalynn Smith on July 7, 1946. When he first proposed marriage, she refused him. Early the following year, however, he proposed for a second time and she accepted. They have 4 children named Jack, Chip, Jeff & Amy Lynn. Facts and Info: Jimmy Carter belongs to the Democrat Political Party. He was 52 years old when he was inaugurated as the 39th president. Inauguration is a President's swearing-in ceremony. Walter Mondale stood as the Vice President. For additional facts refer to his Presidential Cabinet members. Short Biography of Jimmy Carter: What he was like! Facts and Info: Jimmy Carter is of average stature standing at 5 feet 9.5 inches and weighs approximately 155 lbs. He has sandy hair, hazel eyes and wears contact lenses. He served in the nuclear-submarine program and resigned his commission in the navy following the death of his father as he needed to take over the family peanut farm. He improved production and became a millionaire in the peanut industry by 1979. A giant peanut-shaped balloon was part of his Inauguration Day parade. Facts and Info: During his lifetime he played a key role in important events of the era and was awarded the 2002 Nobel Peace Prize. Jimmy Carter was instrumental in pardoning the Vietnam War era draft evaders and negotiating the Panama Canal Treaty. In 1979 Jimmy Carter finally recognized the People's Republic of China, which had replaced the Taiwan-based Republic of China as the sole Chinese government. 1979 also saw problems at home. The Three Mile Island incident in Harrisburg, Pennsylvania involved a cooling malfunction at a nuclear power plant. There were no injuries or adverse health effects but it was a very disturbing event. The Iran Hostage Crisis followed the seizure of the American embassy in Tehran by Iranian students when 52 Americans were held hostage for 44 days before being released. The short biography of Jimmy Carter provides a fast overview of the key facts and events about his life and the accomplishments of his presidential term in office. The following Jimmy Carter video enables you to sit back and listen to the history of his personal and political life - a useful educational resource for kids, children and schools learning about the life of President Jimmy Carter.